NADCAP, or National Aerospace and Defense Contractors Accreditation Program, is an Aerospace and Defense cooperative designed to combine each Primes requirements for special processes into one accreditation program. It is a global initiative to approve supplier’s specialized services and to improve their overall quality. Interface Welding is an International Traffic in Arms Regulations (ITAR) compliant job shop, a requirement by the U.S. government for all manufacturers, exporters, and brokers of defense articles, defense services or related technical data. 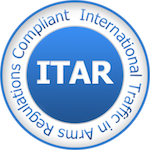 We are registered with the United States Department of State, demonstrating that we are educated and trained in ITAR regulations.